William Henry “Curly” Shonrock Sr., 101, passed away peacefully on Tuesday , November 24, 2015 at his son’s home in Bryn Mawr, Pennsylvania. Curly was born October 1, 1914 to Heinrich Wilhelm and Martha (Kempa) Shonrock in Chicago, Illinois. He grew up on the southwest side of Chicago where he attended German school through the fourth grade and then public school. He left high school after one year to go to work to help support his family. In his early years he enjoyed sports and was quarterback for the Clearing Ramblers and shortstop for the Clearing Collegians. In 1940 he married Rosalie Louise Kamm and they had three children, William Jr., Cynthia and Douglas. He served in the U.S. Army in the medical corp from 1943 through 1946 in the Pacific theater and the island of Biak. He held various jobs in the Chicago area until 1937 when he joined the Visking Corporation which merged with Union Carbide in 1957. In 1964 he was transferred to Centerville, Iowa to participate in the start-up of a new plant and completed his career as a production supervisor in the flexographic printing department in 1977. Curly’s wife died in June, 1996 and he moved to South Padre Island in 2000 and lived in his own apartment in his daughter house. He enjoyed gardening, walking on the beach, and visiting with friends at the Wanna Wanna Beach Bar, which he called his office. 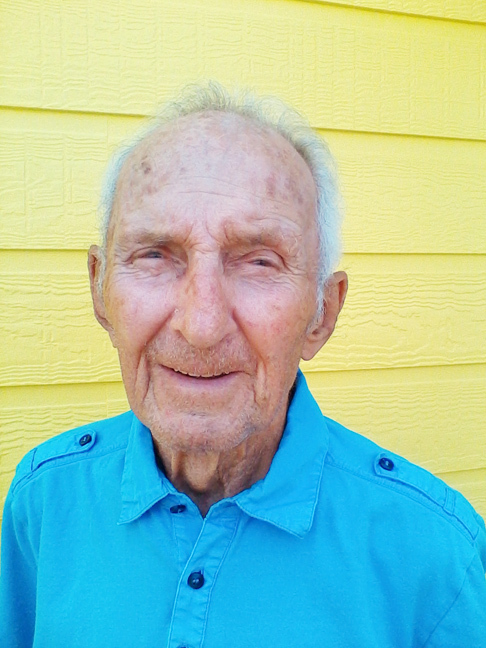 Curly celebrated his 100th birthday with all his children, grandchildren and great grandchildren plus other relatives and friends on South Padre Island in October, 2014. In April, 2015 he moved to his son’s home in Bryn Mawr, Pennsylvania. He was an active member of the Knights of Columbus of St. Mary’s Catholic Church in Centerville, Iowa from 1964 to 2000. Curly is survived by his children, Cindy (Blain McCulloch) Shonrock of South Padre Island, Texas, and Doug (Julie Thorndyke, DVM) Shonrock of Bryn Mawr, Pennsylvania, six grandchildren Kelly (Jeff) Seyller of Colo, Iowa, Derek (Sarah) Shonrock of Coralville, Iowa, Sara (David Larson ) Shonrock of Eagan, Minn., Maggie Shonrock of Evansdale, Iowa, Abigail Shonrock of Washington, D.C. and Tyler Shonrock of Bryn Mawr Pa.; and eight great grandchildren, Molly, Libby, Jack, Nora and Andrew Seyller, Micheal and Sadie Shonrock, and William Larson; and numerous nieces and nephews. He was preceded in death by his parents, wife Rosalie, son William Jr., and all his siblings Marge (Alexander) Shonrock, ArthurShonrock, Elaine (Ross) Shonrock and Dale Shonrock. A Memorial gathering will be held on Saturday, December 19, 2015 at 1:00 p.m. at the Wanna Wanna Beach Bar.